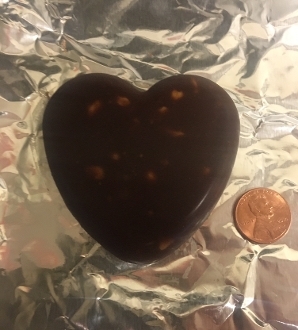 These Chocolate hearts are made from 24k Gold White Powder Gold, Noble 8 elixir, Gold Ormus, Organic Cold-Pressed Cacao Powder, Grade B Maple Syrup, and Organic Cold-Pressed Coconut Live Ormus Oil, Raw Cacao Butter, and Organic Peanut Butter. All the ingredients are Organic, Vegan, Non-Gmo, there's no Glutton, no Dairy,and No sugar is even added. So not only are the good for everybody these are extremely delicious too. Rich like Dark Chocolate yet they also taste like milk chocolate in a way. Either way I found my newest treat that's delicious and nutritious so I'm excited to share it with you. This White Powder Gold was made using a variation of the John Hudson method with 24k gold leaf, Gold rich mineral powder, Organic Dolomite Lime, and reconstituted Dead Sea Salt Water. The Gold rich mineral powder comes from Mother Earth Alchemy which they use in their process of making WPG as well. Out of all the powders I've experienced theirs is the most potent so I replicated the process and added 24k gold leaf to the procedure as well to increase to potency. This is very potent WPG and only requires a pinch under the tongue, sublingually. You can also put it in your drink or smoothie or apply it topically to wherever gold can help restore your skin on your body. -To be a powerful antioxidant against free radicals. -To have antiseptic and anti-inflammatory properties. -To enhance ionic movement in tissues and lymph system to improve circulation. -To reduce fine lines and wrinkles. -To improve the firmness and elasticity of the skin. -To tighten pores and smooth the skin. -To hydrate skin from losing moisture. -To synergize absorption of collagen, nutrients and essences of herbal and botanical extracts. -To regulate or balance oil/fat secretion to protect the skin from bacteria. -To delay the aging process. -To help increase nutrients into the skin. This liquid Ormus gives you the benefits of Dead Sea Ormus that is extremely high in gold. I made this Gold Ormus by first using low voltage DC electrolysis with a 24k solid gold wire. Once it measures at 10ppm of ionic gold I then take that clear water and add equal parts of Dead Sea Salt and Natron. After mixing it all up I let it sit and I wash it 3 times with distilled water then its ready to go. The yield of concentrate is about doubled from what I would get with just Dead Sea Salt alone. So much so that I had to transfer the product to a larger container to wash it. So you can imagine this is some pretty potent gold Ormus. Grade B maple syrup is usually made at the end of the sugaring season, just before the maple trees bud. Almost as dark as molasses, the very strong, intense flavor of Grade B has been described as “hard–core.” Traditionally considered a cooking–grade syrup, Grade B has gained popularity in recent years as a table syrup. It is also well known for its beneficial use in a cleansing fast known as the Master Cleanse. Although we are very happy that Stanley Burroughs, the author of The Master Cleanse, recognized the health benefits of pure maple syrup, we are disappointed that Mr. Burroughs did not really understand how maple syrup is made. He recommended Grade B syrup because he assumed, probably due to its dark color and intense flavor, that it was less refined than other maple syrups. However, NO pure maple syrup is refined in any way whatsoever. ALL pure maple syrup contains many beneficial nutrients, including minerals such as potassium, magnesium, and iron. Traditionally, maple syrup is considered to be good for digestion and the circulatory system. It has fewer calories most other sweeteners and contains no fat at all. One of the greatest health benefits of cacao comes from the flavonols (a class of flavonoids – antioxidants) that are found in cacao. Schardt notes that “Flavonols are bitter tasting, so to make cocoa more palatable, chocolate manufacturers roast, ferment, pulverise and sometimes alkalinize the beans or cocoa…unfortunately, this processing can destroy a lot of the flavanols”. Raw cacao is somewhat different from the common "Cocoa" most of us grew up with in our Afghan biscuits. Cacao (pronounced "cu-COW") refers to the Theobroma Cacao tree from which Cocoa is derived, and is used when referring to unprocessed versions of the cacao bean. Normal cocoa powder and chocolate have been chemically processed and roasted, which destroys a large amount of the antioxidants and flavanols (the things that keep you young and healthy). A recent study suggested that between 60% and 90% of the original antioxidants in cacao are lost through common "Dutch processing". Dutch processing was originally developed in the early 19th Century to reduce the bitterness, darken the colour, and create a more mellow flavour to chocolate, but unfortunately also eliminated a bunch of the goodness. Non-organic cocoa (and non-organic chocolate) has also been treated heavily with toxic pesticides and fumigation chemicals, and may contain genetically modified (GMO) products. If that wasn't enough, Oxfam estimates that over 70% of the world's cocoa is grown by indigenous communities who are paid such a low wage that poverty is widespread. In some instances child slaves are used, forced to engage in dangerous work such as using machetes and applying toxic pesticides. Big incentive to reach for a bar of fairly traded chocolate when your next craving hits! Raw Organic Fairly Traded Cacao in contrast has bountiful benefits, so you can add it to your diet with no guilt, just good old chocolatey deliciousness. Raw Organic Cacao has over 40 times the antioxidants of blueberries. Yes 40 times! It has an amazing ORAC score of 98,000 per 100g, vs blueberries at a mere 2,400. ORAC scores measure the ability of antioxidants to absorb free radicals (that come from pollution and toxins in our environment), which cause cell and tissue damage and can lead to diseases such as cancer. On a plant-based/vegan diet and looking for iron? The search is over! Cacao is the highest plant-based source of iron known to man, at a whopping 7.3mg per 100g. This compares to beef and lamb at 2.5mg, and spinach at 3.6mg. Note the iron in cacao is non-heme (as is all plant-based iron), so to get the maximum benefits you'll want to combine it with some vitamin C. Think oranges, kiwifruit, superfoods like gubinge or camu camu (which have 40x more vitamin C than oranges), or try out my Choc Orange Smoothie recipe for a Jaffa-tasting throwback. Raw Organic Cacao is also one of the highest plant-based sources of magnesium, the most deficient mineral in the Western world. Magnesium is important for a healthy heart, and helps turn glucose into energy enabling your brain to work with laser-sharp clarity and focus. The reason why you might turn to a bar of chocolate during an all-nighter at your desk! Cacao is a great source of four scientifically proven bliss chemicals - serotonin, dopamine, anandamide and phenylethylamine. These neurotransmitters are associated with cosy feelings of wellbeing, happiness, and can even alleviate depression. A natural, healthy, delicious (and legal) way to get your happy buzz on. This Coconut Oil has been treated with Dead Sea Salt using the live oil method for 3 days. Cold pressed Organic Coconut Oil is antibacterial, antimicrobial, and antifungal! Studies have shown that coconut oil destroys the bacteria that can cause tooth decay. Coconut oil is also used in Oil Pulling and supports weight loss when ingested. Coconut oil has a multitude of health benefits, which include but are not limited to skin care, hair care, improving digestion and immunity against a host of infections and diseases. The oil is used not just in tropical countries, where coconut plantations are abundant, but also in the US and the UK. People are discovering the wonders this oil can create and it is again gaining popularity throughout the world. There is a misconception spread among many people that coconut oil is not good for heart health. This is because it contains a large quantity of saturated fats. In reality, it is beneficial for the heart. It contains about 50% lauric acid, which helps in actively preventing various heart problems like high cholesterol levels and high blood pressure. Coconut oil does not lead to increase in LDL levels, and it reduces the incidence of injury and damage to arteries and therefore helps in preventing atherosclerosis. Studysuggests that intake of coconut oil may help to maintain healthy lipid profiles in pre-menopausal women. Coconut oil is very useful for weight loss. It contains short and medium-chain fatty acids that help in taking off excessive weight. Research suggests that coconut oil helps to reduce abdominal obesity in women. It is also easy to digest and it helps in healthy functioning of the thyroid and endocrine system. Further, it increases the body’s metabolic rate by removing stress on the pancreas, thereby burning more energy and helping obese and overweight people lose the weight. Hence, people living in tropical coastal areas, who use coconut oil every day as their primary cooking oil, are normally not fat, obese or overweight. The numerous health benefits of this tasty snack include benefits to the heart and colon, protectionagainst certain diseases including Alzheimer’s and gallstones, and high levels of antioxidants, potassium, and other vitamins and minerals that are important to incorporate into what you’re consuming daily. Don’t just leave peanut butter to the kid’s lunch boxes anymore — here are five reasons why peanut butter may be just the food you need to incorporate into your diet. If you’re looking to aid your workout routine with a food that can both boost testosterone levels and help you lose weight, eating peanut butter daily can keep your energy levels high and assist you in completing difficult workouts. Men’s Health talks about the testosterone boosting powers of this health food — if you’re looking for more natural ways to increase your muscle building capabilities, then eating foods with nutrients that assist in testosterone production is the key. Peanuts and peanut butter offer healthy levels of zinc, which is a nutrient known to play with hormone levels and increase testosterone levels in just four weeks if eaten regularly. In addition to zinc, a study found on Muscle for Life shows that men who eat plenty of monounsaturated fats, like the fats found in peanut butter, have higher testosterone levels than those who avoid them. By increasing your healthy fat and zinc intake, you may notice a difference in how quickly you’re able to build muscle and keep fat levels at bay because of this testosterone boost — and your libido may increase as well. As far as weight loss goes, it may seem counterproductive to eat fats to lose fat, but peanut butter certainly proves that certain fats can help you ward off excess weight. Men’s Health discusses how people who eat a diet rich in foods like avocado, olive oils, and peanut butter are more likely to not only lose weight, but also keep the weight off for longer than those who follow a low-fat diet. Peanut butter is a treat that doesn’t leave you wanting something else — it’s satisfying and filling because of its high protein content, leaving you full for hours and giving you the energy you need to perform daily tasks. Typically, those who are eating peanut butter aren’t reaching for sugary snacks once they’re finished, as they are satiated with what they’ve already had. Most of us already know that peanut butter is high in protein, but that’s not all that the humble peanut has to offer. Prevention reminds us that peanut butter is also rich in potassium, which is the perfect mineral for regulating fluids in your body. With one serving of peanut butter offering 208 mg, it’s great for maintaining good heart and kidney health, and it generally helps all of your other organs function normally. Potassium aside, peanut butter is also rich in magnesium, which helps with energy production and bone growth, and vitamins E and B6, which protect the heart and assist in normal brain function. Your digestive system, skin, and nerves can also benefit from peanut butter, as peanuts are high in niacin according to the Peanut Institute. Peanuts are also high in folate, which can prevent heart disease and thiamin, which helps the body convert carbs to energy, and riboflavin, which helps metabolize fat, carbs, and proteins. There are also small amounts of copper, selenium, manganese, and iron in peanut butter which, when eaten with a healthy diet, can ensure you are reaching the proper levels of these minerals. While peanut butter is full of various vitamins and minerals, you may not also realize that peanuts have high levels of antioxidants — levels that can even rival some antioxidant-rich fruits that are often advertised for their benefits. The World’s Healthiest Foods talks about the antioxidants found in peanuts by first discussing resveratrol, an antioxidant that is originally found in red grapes and red wine, and is also found in peanuts, that can help prevent damage to blood vessels and prevent blood clots. It’s also thought that resveratrol can contribute to a reduction in the risk for cardiovascular disease, which may be why the French, who are frequent drinkers of red wine, have a lower risk of heart disease than Americans. Peanut butter has higher antioxidant levels than apples, carrots, or beets, and is more on par with the levels found in blackberries and strawberries. A group of University of Florida scientists conducted research on the antioxidant levels of peanuts, and they found that they hold high concentrations of polyphenols. The term “polyphenol” refers to the thousands of plant-based molecules that have antioxidant properties that assist in proper enzyme function and the elimination of harmful free radicals that can damage cells. The University of Florida scientists, who published their findings in the journal Food Chemistry, found that consuming roasted peanuts or peanut butter can boost their antioxidant levels by up to 22%. According to Daily Mail, there’s really great news for peanut butter lovers — eating peanuts or peanut butter five times a week can nearly cut your risk of cardiovascular disease in half. This is because peanuts can reduce inflammation throughout the body and make the blood vessels around the heart stronger and healthier while also reducing bad cholesterol due to the high levels of polyunsaturated fats found in the peanuts themselves. According to a study published by The British Journal of Nutrition found on The World’s Healthiest Foods, those who ate nuts (or peanuts and peanut butter) at least four times a week showed a 37% reduced risk of coronary heart disease compared to those who rarely ate them. In addition to staying heart healthy, the folic acid, phytic acid, and resveratrol found in peanut butter may also ward against certain types of cancer. Peanuts have been found to particularly protect against colon cancer, which is the third most frequent cancer in the world, and researchers found that eating peanuts or peanut butter just two or more times a week was associated with a 27% lowered risk in men. The phytosterols found in peanuts, which are plant-based molecules related to cholesterol, are also known to reduce bad cholesterol and also possibly protect against lung, stomach, and prostate cancer. In addition to being great for the heart and body, peanut butter can boost your brain health and help to ward off diseases such as Alzheimer’s. The Peanut Institute reminds us that peanuts are high in both niacin and vitamin E, which are both nutrients shown to protect against Alzheimer’s and age-related cognitive decline. In a study of nearly 4,000 people 65 years of age and older, researchers found that those who ate more niacin were the ones more likely to retain their cognitive abilities better than those who did not. Also, in a study that followed 815 people over the age of 65 around for four years to see if vitamin E offered protection against Alzheimer’s, the results were as follows — taking vitamin E supplements did not have any effect one way or the other, but consuming vitamin E through foods like peanut butter did offer higher levels of protection. And, those who consumed the most vitamin E and niacin out of the group had a 70% lowered risk of developing Alzheimer’s than those who did not consume as much.